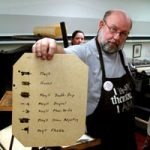 October 27, 2006 John Horn gave a platen press workshop at The University of Alabama MFA in the Book Arts Program. John is a passionate printer of small books and broadsides. The song “Human” by Russell Wolff is included.